This morning we woke up, as predicted, to some new snow, not a lot, but new anyway! The game plan was the same; inspection, race, wait, inspection, race and then it’s all over. Many will go back with memories of an exciting time having performed at their best and delivered all their objectives. Others will go back with a more detailed training plan for greater success and training to be implemented for next year and in time for the 15th February 2014 when the next English Alpine Championships take place. As the racers prepared for the challenge of the FIS male and female slalom, last minute tactics and strategy are reviewed with their coaches. Ian Findlay (SSE Talent Officer) was master of ceremonies today bringing his own style of support for our lads and lasses as they crossed the finish. We are delighted to post that we have British skiers in 3rd and 4th places, well done to Robert Bullen (9) (0.91s off the lead) in 3rd and Nicholas Moynihan (17) (1.13s off the lead) in 4th place. Well done also to Nicole Richie who secured a top 10 place for the girls. …..And so as the Pisten Bully unceremoniously carves up the slalom course which so many had trained hard to conquer, the championships came to an end. One final point – has anyone seen these skis? (well ones just like them)..
Lee Bennett had his skis stolen from Bormio 2000 restaurant today as he was watching the final of the men’s competition. It appears someone left their old Elan skis and skied off with his. If you see or hear of anything please let me or SSE know. Good bye from me and the Sunderland Ravens ! Day 5 in Bormio – snow has eventually fallen (and is still falling)! Hi everyone and welcome to the fifth day of racing and training at Bormio. For the past 2 days we have been forecasting snow which is much needed in this quaint Italian resort. Although it was forecast to arrive last night we woke up to the same scenes as yesterday but were soon seeing snow clouds over Bormio 3000 and flurries of snow at that level. By lunchtime the snow had made its way down the mountain and was upon us. 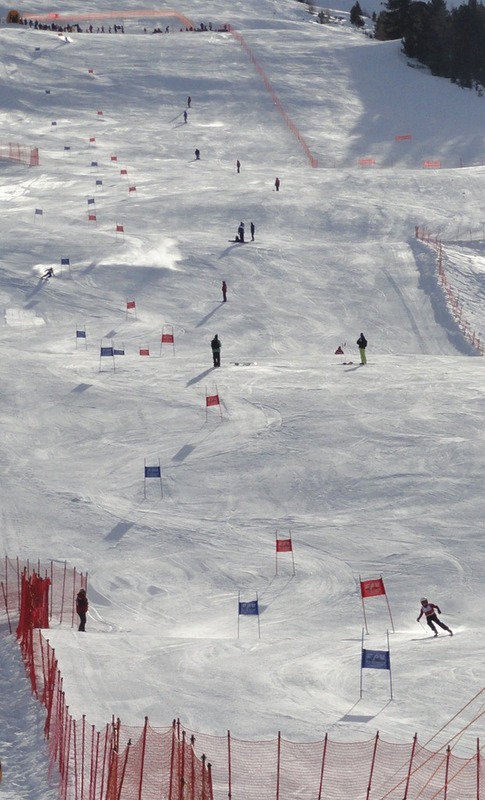 The racing today was the last of the junior races and consisted of the U14/U16 slalom for girls and boys and a GS on the Stelvio piste. As usual course inspections were opened early with racers and their coaches taking the opportunity to check out the icy piste. 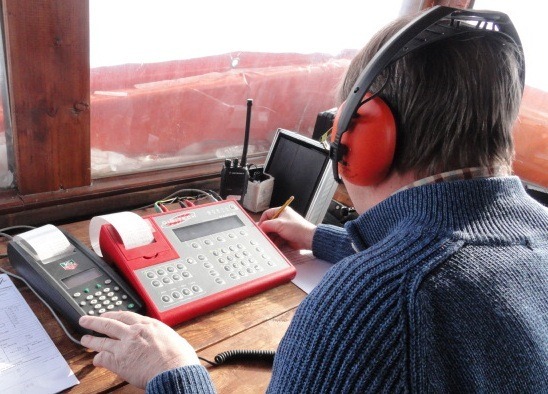 At the bottom of the slope preparations were in place for another faultless day in the timing cabin as Gillian, Felice and Deb were organising themselves to record the times in the official manner. 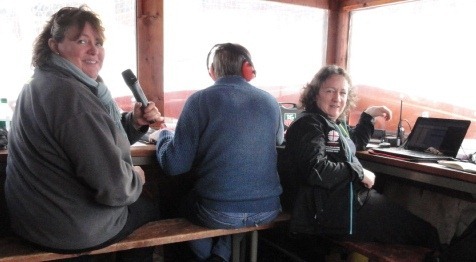 Gillian Poth and Deb Manns are able to pose for the photo while Felice, who is from the Bormio race timing team, is too busy concentrating on the job in hand. All of these folks are volunteering their services. 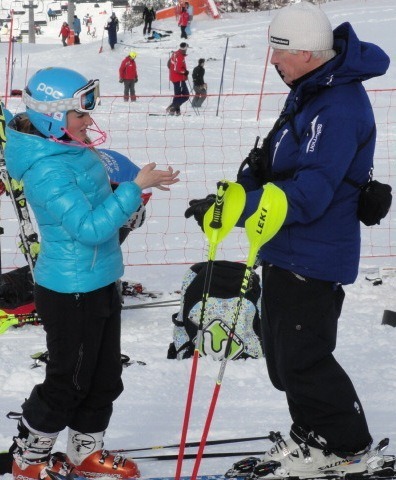 Gillian’s son Robert is one of the top U16 GB racers, while Deb’s direct involvement with her children finished some years ago but her son David is now a coach with Evolution in Austria. 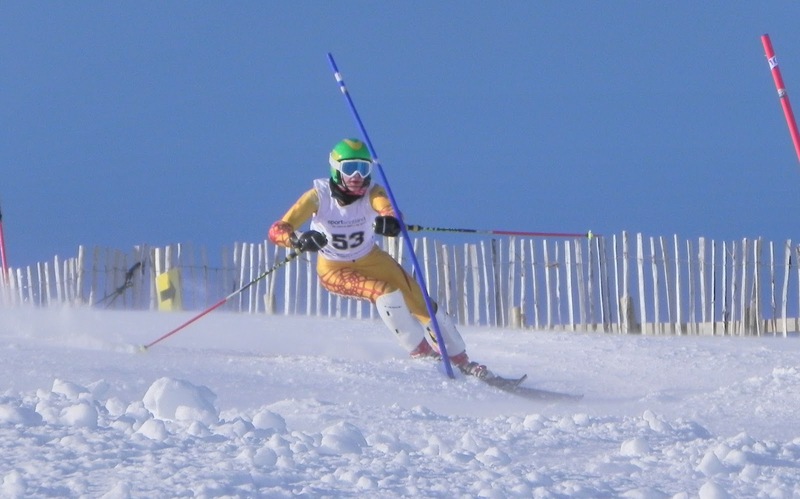 Robert came in first place today in his U16 Slalom competition, well done Robert. Congratulations also to Megan Jenkins who won for the girls U16 and to Alicja Krahelski (pic) who won for the U14 girls and Angus Wills for the boys. With the snow still falling it looks like a powder day tomorrow so ditch those narrow slalom skis and get your wide boys on! Fact of the day – Sochi Olympics are just 350 days away. 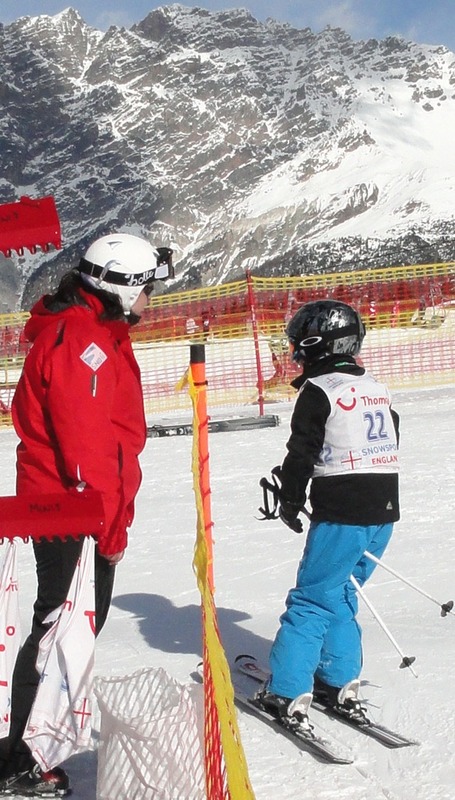 Day 4 in Bormio – new race format gets thumbs up from coaches and kids. Once again an early start was made to the day with the inspections of the U10/U12 combi race and the U14/U16 GS races happening at 9am. Many folks, including SSE, for some time didn’t know the exact format of the minis race. 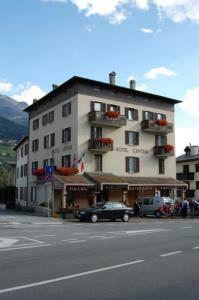 But following a meeting with the Bormio team the format became clear. The combi race is a multi facetted race to test and develop many of the aspects of the alpine disciplines. The coaches agreed that setting a course with wide gates, verticale, jumps and tunnels would mimic the various elements in slalom, GS and Super G.
As usual, these events can’t take place without the aid and support of a wide range of volunteers and it was Lions Ski Club who stepped up to the mark today to offer assistance with timing gear and prizes – many thanks to them. Mums and dads waited eagerly to see their little loved ones come over the last jump and into the finish area. For one skier, George Fisher (22), the temptation to spray the whole crowd with icy snow was too great a temptation – thanks George . Meanwhile on the same slope, just 30m away, our U14 and U16 boys and girls were testing their mettle against Stella Alpina. While the course was challenging and the snow conditions very icy, it seems the majority of racers had a safe run and enjoyed the experience. 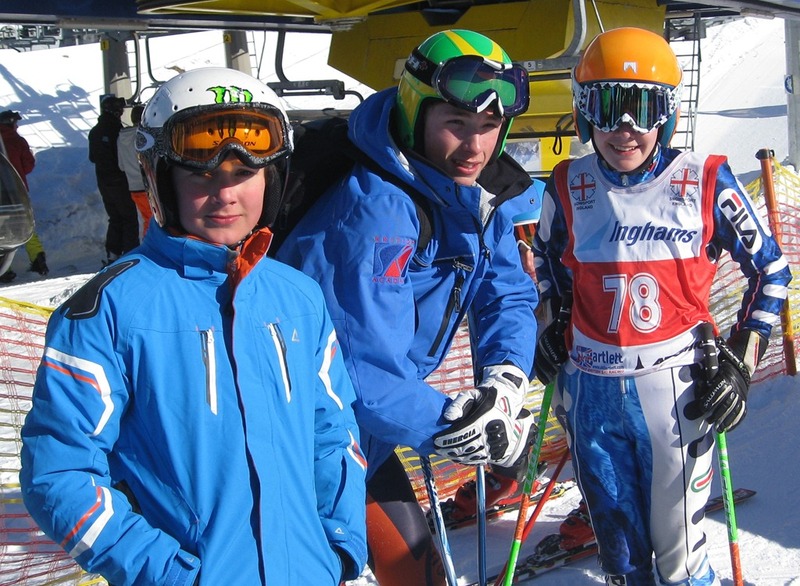 Three racers from Ravens Ski Racing Club were very happy with their performances. 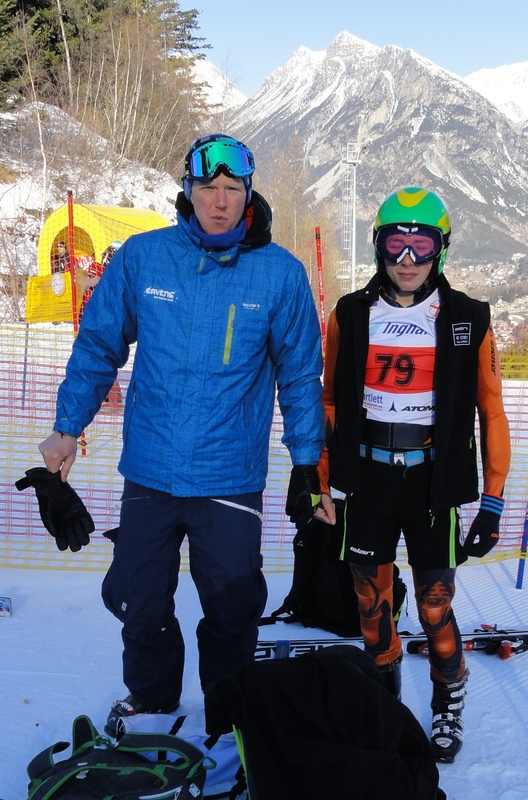 For Laurence Beer (left) and Roddy Weir (right) it was their first Giant Slalom and they posted best times of around 51s while Rory Farren (centre)managed around 47s, well done to you all. 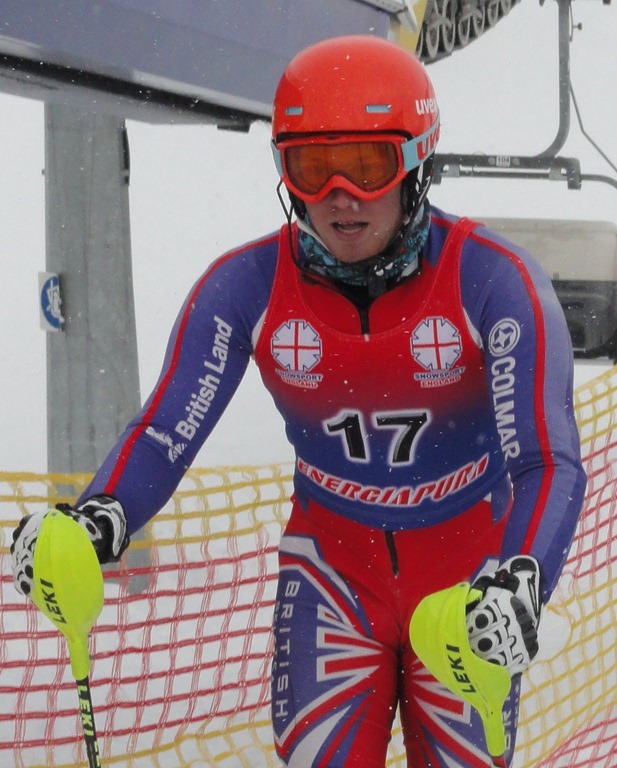 Full race results are available from Snowsports England. …and finally the weather – we are expecting some snow overnight with temperatures around freezing at 1200m. With today’s great weather and fantastic visibility once the sun was over Cima Piazzi, it would be a shame to see a change for the final two days of racing. Good luck to all tomorrow. Fact of the day – this is Bormio’s town flag. Another chilly beginning to the day marked the course inspection of the U10/U12 GS course on Stella Alpine course. The course opened at 8.30 to allow racers and their coaches to inspect the relatively flat but steep and icy course. All racers had 3 attempts to set a time with the best of the 3 being their official time. Mums and dads looked on with eager anticipation as their little ones came down the formidable course. On returning their race bibs all of the racers received a goody bag containing various ski gadgets, waxes, scrapers and stickers kindly donated by Ski Racing Supplies, Ski Bartlett and others who have been very generous in supporting the championships. 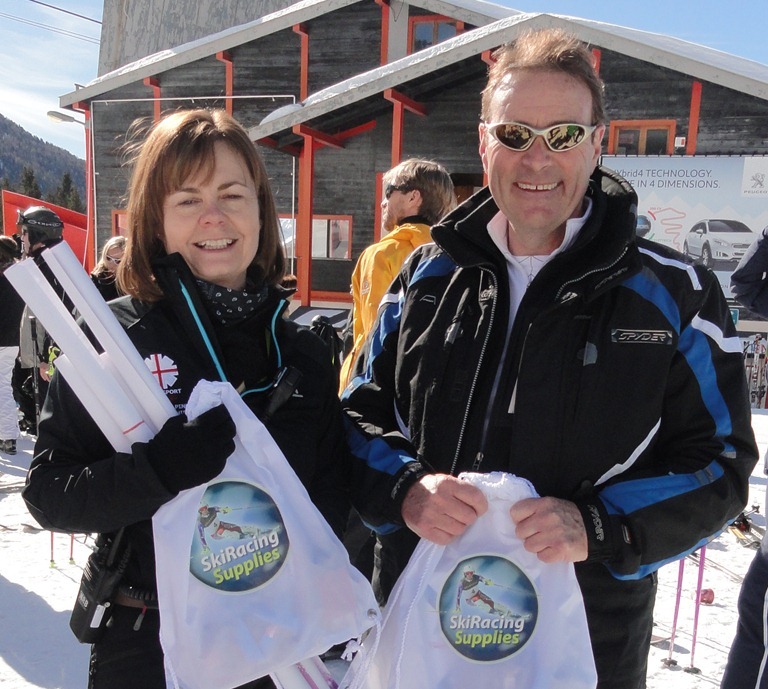 Big thanks to Mr Pete Cutler and Mrs Ryding from Ski Racing Supplies pictured here with their free goody bags. Congratulations to Olivia Mitchell (U12) & Isla Ward (U10) for the girls and to Jake Doyle (u12) and Scott Johns (u10) for the boys, well done to all who skied. Meanwhile on yesterday’s Super G course, the GS took place. 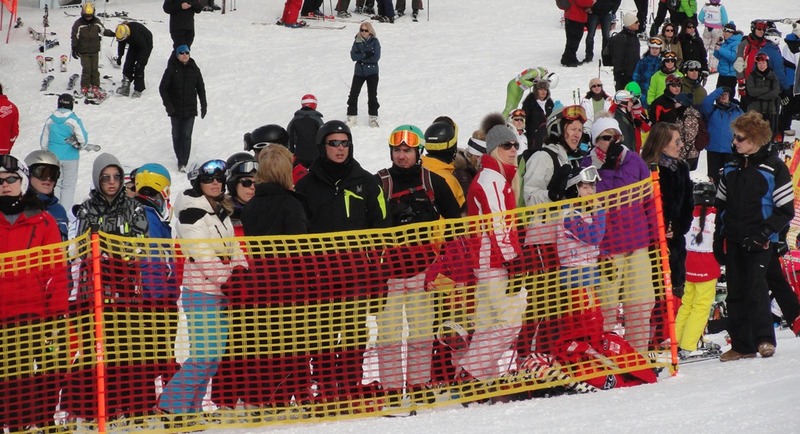 This was again an FIS NJR competition and so was attended by all and sundry from around the skiing world. The results have yet to be published on the FIS website so we couldn’t tell you how well our lads and lasses did today. However we do know that there are a few Dragons enjoying themselves here in Bormio. We caught up with some of the juniors while they were tucking into pizzas and burgers at Bormio 2000. Dragons from left to right are Georgia Hallmett, Jemma Dammatt, Lucy Deller, Tom Henderson, Olly Farr, Sophie Ogden, Nia Jenkins and Alice Macaulay (from Sandown Park ski racing club). 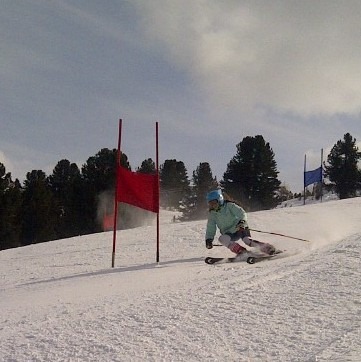 Alice was 10th and Nia was 23rd in yesterday’s FIS slalom. They are currently staying at the Hotel Capitani with their coaches Carl Ryding and Robin Kellen and are all having a marvellous time! Good luck to them for the rest of the week. Weather tomorrow is for about 30mm of snow from late Wednesday night to Friday morning, so take your high definition lenses up with you! 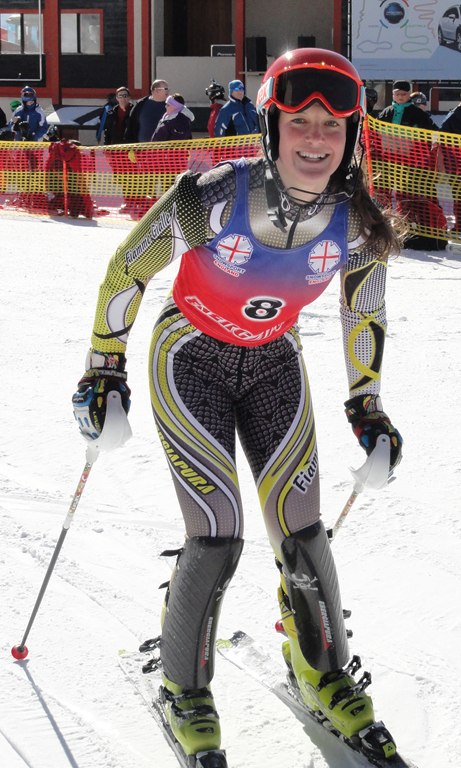 Day 2 in Bormio – Megan celebrates her birthday in style! What an amazing day it must have been for Megan Jenkins who celebrated her 15th birthday today. Not only did she receive the full happy birthday cheer from all of her fellow competitors and mums and dads but she also won the U16 girls Super G. Well done also to Anna Henderson, second and Isadora Taylor who came in third. 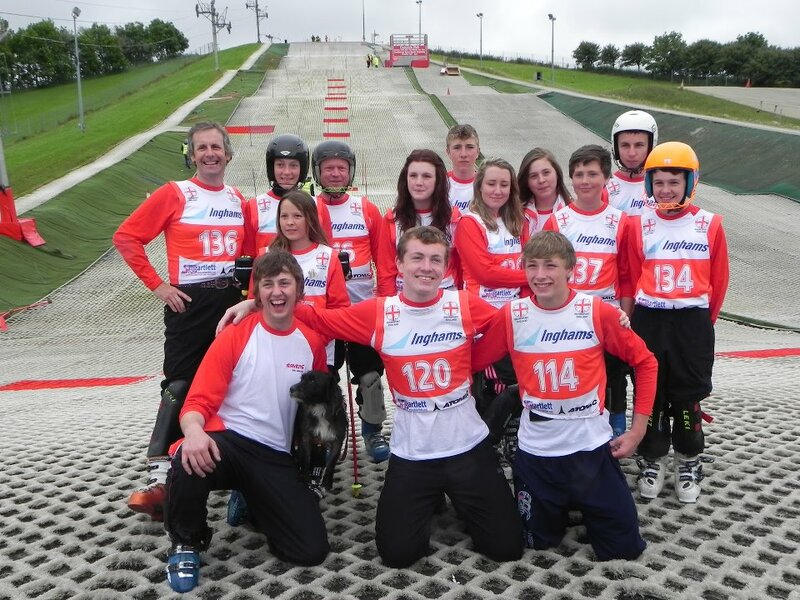 Full results can be found on the Snow Sports England Website. 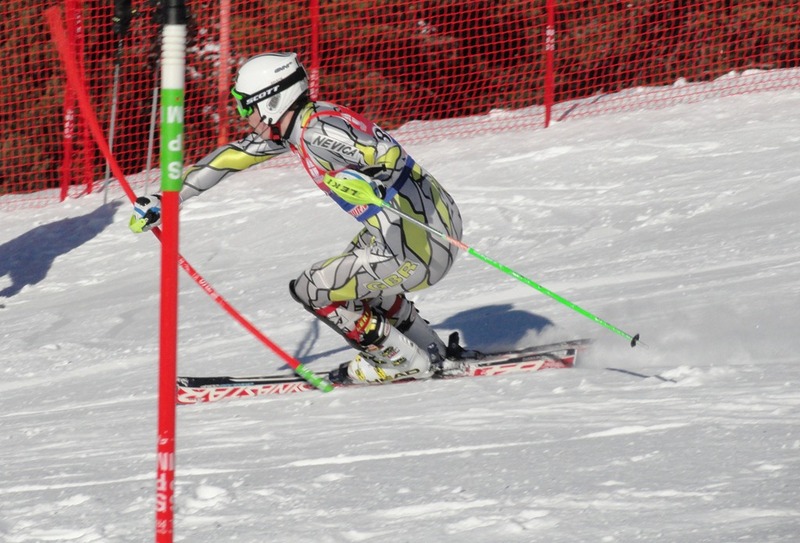 As many of you will know, as well as the boys and girls GS today, the FIS NJR Slalom took place which involves competitors from all over the world. Countries such as South Africa, Pakistan and Jamaica were represented along with Austria and Italy. 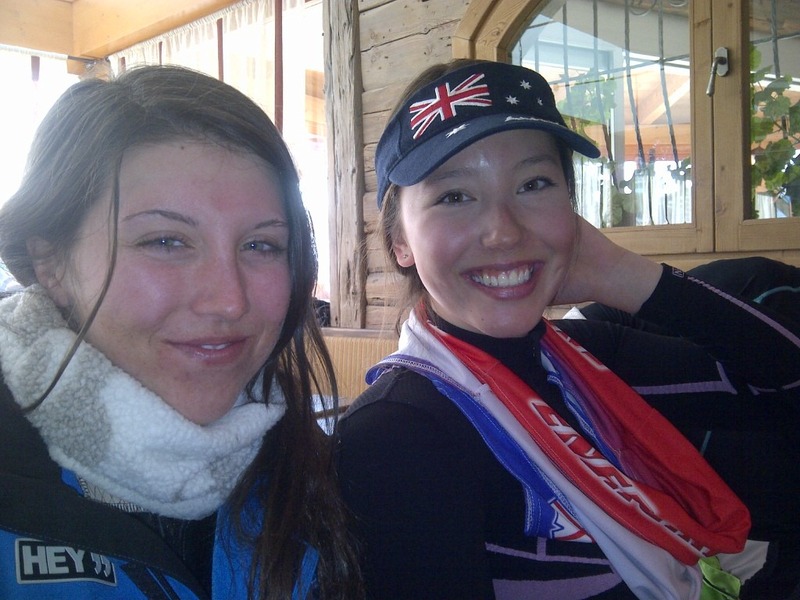 We caught up with two racers from Australia, Toni Hadkinson (Oz cap) and Bobby Kelly both 19 who train under the European Development and Excellence Programme in Montgenevre and Claviere in (our) winter and then head back to Perisher in the Snowy Mountains (just outside Sydney) from June onwards. Good luck to the girls and Ross Peraudo, their 20 year old male racer, during the long season away from home. 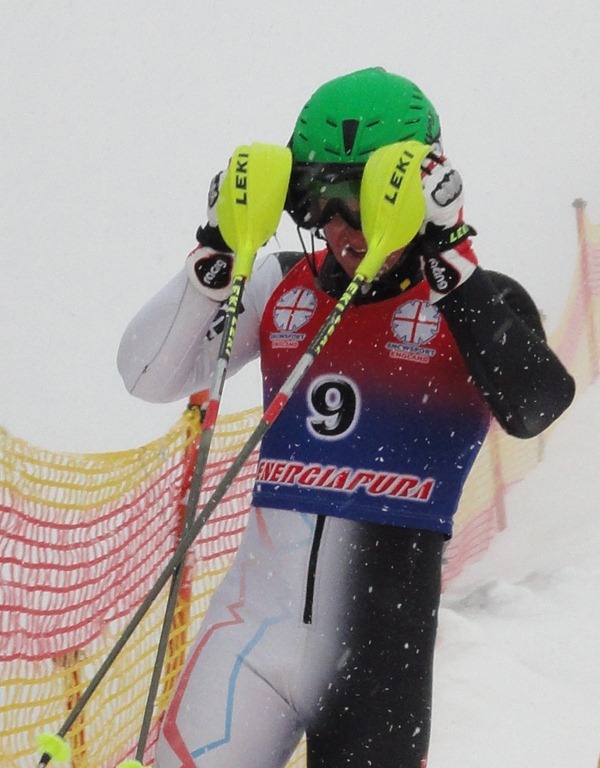 Both boys and girls slalom competitions came to a nail biting end as it seemed that every time a competitor came through the finish line she or he took top spot. 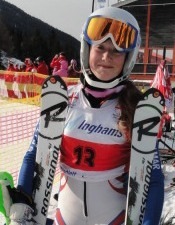 The honours were eventually bestowed on Federica Sosio (pictured) from Bormio and Max Luukko from Finland. 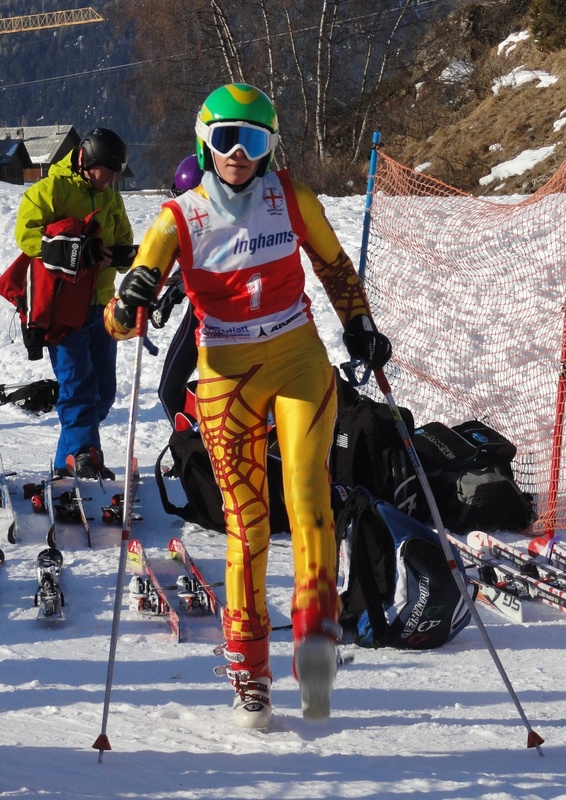 Congratulations to the best of our British racers Rachelle Rogers (CdS Courchevel) who came in a very respectable 6th place and Nicholas Moynihan (Kandahar) who came in a fantastic 3rd place, well done to both of you. Rory Farron came in a very respectable top position but it wasn’t all good news for Adam O’Mara who produced a solid first run in the NJR slalom but then crashed out in the final section on the second run. Tom Larby unfortunately didn’t finish the first run. ﻿A little unfortunate but great practice and experience for these young men. Weather tomorrow is forecast to be the same as today; bullet proof ice in the morning, some sun in the afternoon and temperatures about the same as today. More racing tomorrow with the NJR GS for the boys and girls as well as the U12/U10 GS. Once again good luck to you all. Following a long journey yesterday, parents and skiers got down to the business of ski racing today. It was an early start for some as the Super G training was a 7am start in order to catch the early lifts and the hard packed piste. It hasn’t snowed here since 11th February and it shows it off the piste. However the day started with sun shine and good visibility. 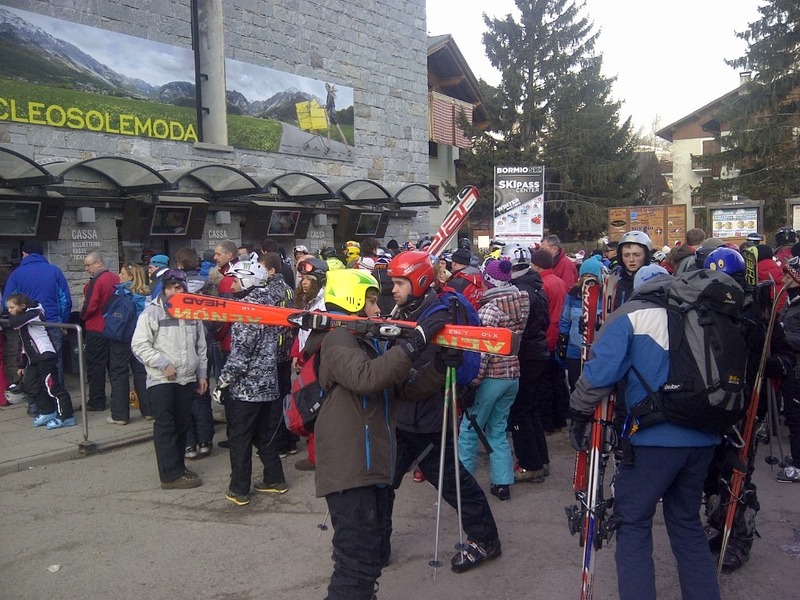 Naturally the first port of call is to pay for and collect your lift pass, there was a small queue but all went to plan. With ski pass in pocket and appropriate skis and poles in hand the skier ventured up the mountain to begin their practice. 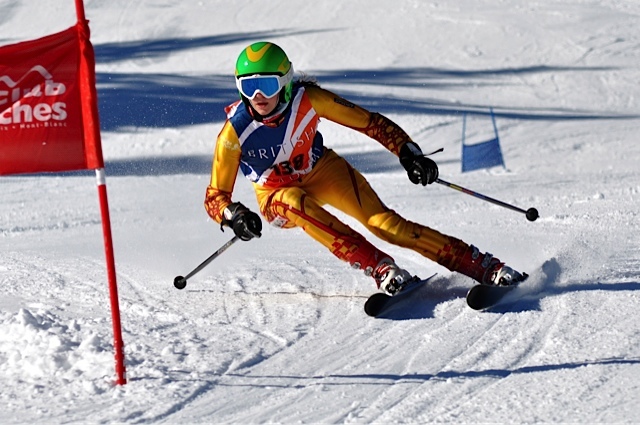 Slalom, GS and Super G courses have been set up to allow racers to become accustomed to the piste and conditions. A long line of willing racers line up for the Super G practice piste down the flood lit Stelvio piste which drops from 1952m down to the town level at 1225m. The piste is very icy but with well prepared skis, can be very grippy. Good luck to those attempting the race, it’s a formidable challenge. The piste is open until 11pm for those who haven’t had enough skiing in a normal day! Further afield GS was being practiced on La Rocca piste with the Ravens, from Sunderland and Dragons Alpine Ski Club from Cardiff. The race training continues tomorrow as well as the start of the actual races. The FIS NJR Slalom and Super-G are kicking off, please see the race officials for exact timing and start lists. 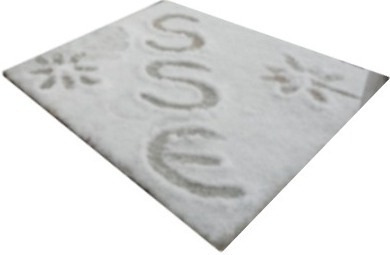 The weather forecast for tomorrow is for a max -1oC min of –12oC, sunny with flurries. While driving abroad in Europe there are certain constraints which if ignored will lead to fines or worse... please read and take note. 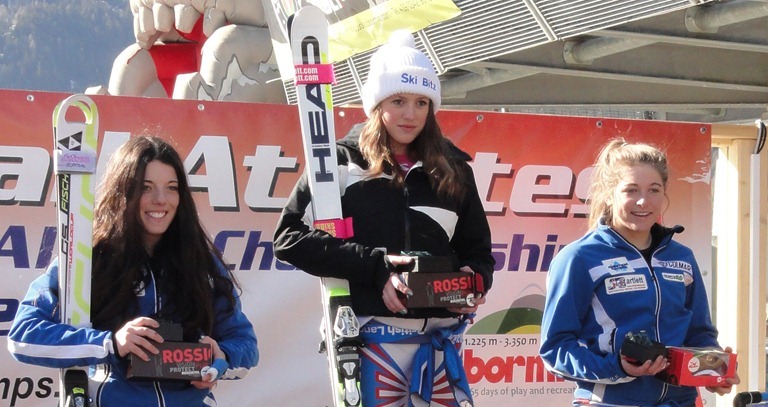 Congratulations to Francesca Lee who won the Girls BASS Race1 U14/U16 at the Glenshee Winter Games 2013 last weekend. Well done Francesca from us all at Ravens!! Today is closing date for entry to the English Champs, after this there will be a late entry fee. Yes results are now out, click on the link to open the full results page. Congratulations to everyone who has looked at the blog, we hit an all time high (PB) of 1154 page views in January. If anyone would like us to cover a specific subject please let me know via the comments box.